Video Tapes to MP4 - VHS, 8mm, hi8, MiniDV + More! 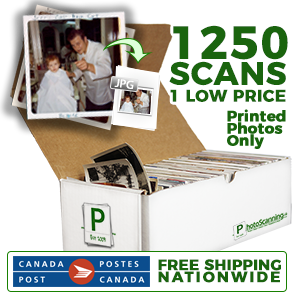 PhotoScanning.ca converts your old home movies into easy to play, store, copy or stream MP4 files for only $13 per tape. Each tape is converted into its own MP4 file, and labelled as best as we can based on what is written or labelled on your tape - you can easily change file names on the FREE USB key provided to you with your video conversion order. Looking for different formats, compression ratios, codecs, etc? Contact us - we keep it simple to be optimal for most clients needs, but we're able to work with you to fit your specific situation. Video files are laaaaaaarge - a single video can be thousands of times larger than a standard scan from a printed photograph - and because of this, it is often difficult to provide clients files - either we're making dozens of data formatted DVDs that only hold 1-2 tapes, or we're charging customers for USB Keys or Hard Drives - both which add extra cost, difficulty, and confusion for clients. We've made it simple - and with our commitment to always work to make our service more affordable we've built the cost of a suitable size USB key or External Hard Drive FREE with every order. You are reading that correctly - not only is our $13 per tape price the guaranteed lowest price in Canada, but we also offer you a USB key for FREE - charged at more than the price of the tape at our competitors! We are solely and 100% focused on promoting the digitization of your materials, and our ultra low pricing has been developed specifically to reflect this. Some clients may prefer a DVD copy of their tapes, formatted for their television's DVD player - this is available for the same $13 per tape price, but our recommendation is to opt for the MP4 version with the complimentary USB. Our minimum order size of $49 applies to all of our services, including our video tape transfers. Orders under 3 tapes are charged $49 plus HST. We have no additional, hidden, or extra fees - $13 per tape & HST, and return shipping if required - That is all. Our smallest size USB key is 8GB. We reserve the right to end this promotion at any time, and to substitute any brand, size, or speed USB key or hard drive at our discretion. USB keys are often rated at USB 2.0 speed, which have slower read/write speeds than a USB key you'd use for every day use. Large institutional, corporate, or archive? We have exclusive options for orders above 1000 hours of footage, including nearly all input and output formats - contact us for details through our large volume information center.